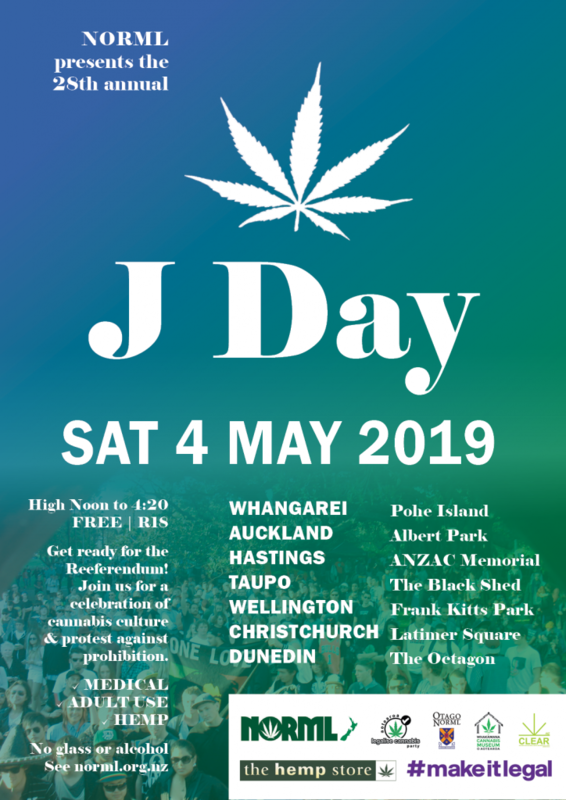 NORML and friends have organised J Day events every year since 1992, and for the past twenty years held annually on the first Saturday in May. J Day is a celebration of our cannabis culture, and a protest against prohibition. It’s the original “protestival”! Come along and learn about medicinal cannabis, hemp, and making adult use legal. All events run High Noon to 4:20pm. J Day is R18, for adults only. No alcohol or glass. Please take your rubbish home with you. J Day events are FREE but please bring a donation to help with our costs. You can also put a donation into NORML’s account: (ASB) 12-3057-0594667-00. Let us know if you would like a tax receipt for donations over $50. Dress to impress – remember we are modelling how law reform will look, so be on-to-it, not out-of-it. Try a Star Wars theme for this year, as May the 4th is also Star Wars Day. Please support our vendors and sponsors, as without them there would be no J Day. Contact us if you would like to run a stall, help out, or sponsor an event. Tell your friends, bring your buddies, spread the word… let’s make this J Day HUGE.